Sometimes thing just don't work the way you planned them. On my Utopia Northern model railroad the grade southbound from Underhill North to the junction at Collings Woods (see the schematic at the previous Utopia Northern layout. Collings Woods was right up against a dual gauge turnout and a second turnout inside the tunnel curved towards the narrow gauge station at Beebe. This had never been satisfactory. The place was prone to derailments (Murphy's law?) mainly because key track components were difficult to maintain. 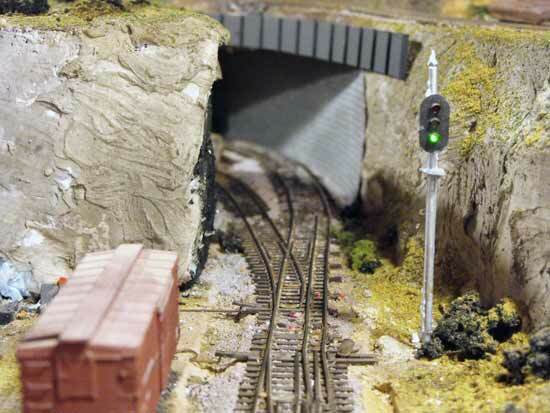 The track underneath the tunnel was hard to reach and I had already modified the cliff (made from ceiling tiles) so it could be levered outwards in order to reach derailed cars in the tunnel. The top of the hill next to the tunnel portal had never been finished. It was removeable to allow access to the turnouts. I procrastinated for a long time and finally decided to rectify the problem. I decided to tear out the tunnel portal. Many modellers shy away from reworking scenery and leave well enough alone. However, as our ability improves and we learn more about the hobby, reworking scenery that isn't up to your standards can make for an interesting project. In this case I had to find a way of making a wall to disguise the lower track passing under the upper track where separation was minimal. I also had to disguise the edge of the plywood and homasote that supported the upper track. My solution was to cut a piece of styrene the thickness of the subroadbed (nominally 1 inch). I has some .060 thickness in my scraps so I used that. I installed styrene "H" beams or channels about 8 scale feet apart and painted it all Floquil Weathered Black. I'm going to miss Floquil and Polly Scale now that they have been discontinued. I temporarily tacked the "bridge" side to the subroadbed with small nails and used Walthers Goo as the adhesive. I plan to remove the nails that can be seen in the photos. The wall was cut from a length of plastic stone wall I had in my drawer. I think it was by Vollmer or one of the other European companies. I've had it for years while it patiently waited for an appropriate use. Using it for reworking scenery seemed to be just the ticket. We're all pack rats! I took the time to paint individual stones with browns and grays and light blacks to give the wall some character and pushed it into place using some more Goo to hold it. Then I ballasted the track that had never been done and added some Woodland Scenics bushes and grass. I left the hill in place and kept a short tunnel at the Beebe end. The back of the hill can't be seen. I painted it black using some leftover house paint. I plan to add some more trees on top of the hill and maybe a house of some description. That will be another project for reworking scenery on my model railroad. 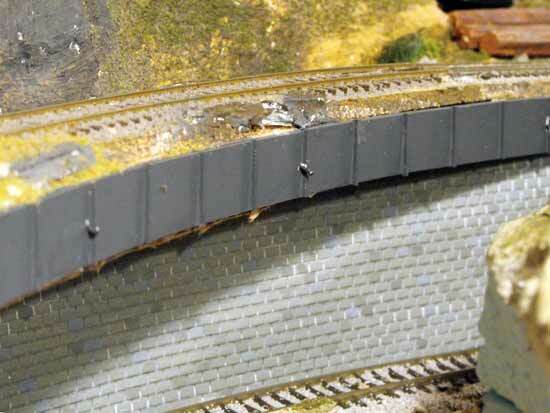 Try reworking scenery on your layout. Find a scene you're not satisfied with and try somethng different. You can always rip it out. Scenery work is forgiving. it's not like installing a sound decoder in a locomotive, building chainlink fences or scratch building a bridge or factory. Go from "reworking-scenery" to the scenery overview. Go from "reworking-scenery" to installing chainlink fencing. Return from "reworking-scenery" to my Home Page.